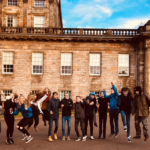 Earlier this week, Primary 7, Mrs Clachan, Mrs Bradley and Mrs O’Connell visited Rozelle House, an arts venue, museum and exhibition space of historical and cultural importance – all a mere mile or two away from Wellington! Rich in many exhibits (have you seen the Yeomanry Museum?) and works of art (we challenge you to find the Rembrandt sketches! ), it is a wonderful place of learning. Here, the children indulged their curiosity in the famous tale ‘Tam O’Shanter’ by Ayrshire’s most famous son, Robert Burns (Rozelle is the permanent home of Alexander Goudie’s brilliant Tam O’ Shanter cycle of paintings). Our tour guide, Adam, gave his first ever tour (we never would have known, had he not said) and was a source of knowledge and humour which delighted the children and teachers alike. His knowledge of Alexander Goudie’s style, of the artist’s craft and of the tale of Tam O’Shanter made this an insightful, educational and memorable trip. Alexander Goudie was originally from Paisley. His ‘greatest single artistic achievement was a magnificent cycle of paintings inspired by Robert Burns’s Tam O’Shanter. Goudie summed up the poem, which had captivated his imagination since childhood, as “a gothic tale, strewn with vivid and awesome images”. The Tam O’Shanter series, completed in 1996 and donated to South Ayrshire Council by three benefactors, is on display at Rozelle House, a stone’s throw from Alloway, the setting for the poem. Comprising 54 large paintings, it establishes Goudie as a master both of dramatic composition and pictorial mood, capable of handling complex scenes of bucolic conviviality as well as nightmarish visions of hell and damnation. His treatment of the black mass in the Auld Kirk led a minister of the Wee Free Church to protest at the picture’s blasphemy. The narrative cycle brims with much of the energy of the original poem: Goudie used mixed media to achieve his effects, marrying passages of charcoal line drawing with highly accomplished painting. Sly humour pervades the series. A depiction of Tam about to roast in Hell – “like a herrin’ ” – bears scorch marks on the frame, which were meticulously applied by Goudie with a blowtorch. The compelling narrative cycle, beautifully realised, was the culmination of a lifetime’s experience and observation as a painter.’ View all of Goudie’s Tam O’Shanter paintings here. Source: Goudie’s Obituary in The Telegraph. Afterwards, the children enjoyed the Brick City lego exhibit, a celebration of some of the most famous landmarks in the world – made entirely out of LEGO!. Made by Warren Elsmore (a big name in the world of LEGO), these incredibly detailed models contain thousands of pieces and cover 62 well-known buildings. The owner of Rozelle House, Douglas Hamilton, was a sugar merchant and slave-owner. This tied in well with the children’s current study topic ‘The Slave Trade’. A mural in Rozelle House reminds visitors that Rozelle, along with many other stately homes, were built with money from this dark period in our history. The mural, depicting many aspects of the trade, enthralled Primary 7 and brought the topic to life.